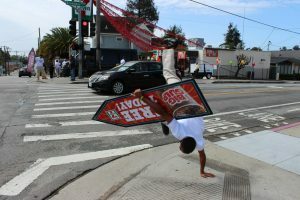 There isn’t a sign spinner out there that doesn’t frequent their local 7-Eleven. This month, 7-Eleven came to AArrow to team up and promote their Free Coffee & Free Big Gulp give away across the country. Drink up, this amazing offer is only available for a limited time only. Coming to a store near you; we’ll point the way! PreviousPrevious post:GianFranco Palacios is named November Spinner of the Month!NextNext post:Pat McAfee spots Michael Moore in Los Angeles!